You get tragedy where the tree, instead of bending, breaks. A three-story building in northern Guatemala City fell into a sinkhole in May 2010. Besides the sinkhole, during the same period, Guatemala experienced torrential rains triggering floods, 140 landslides, and falling boulders. To cap it all, Pacaya, a volcano just south of Guatemala City, erupted, blanketed the capital in ash, destroyed 800 homes, and forced the closing of the city's international airport. 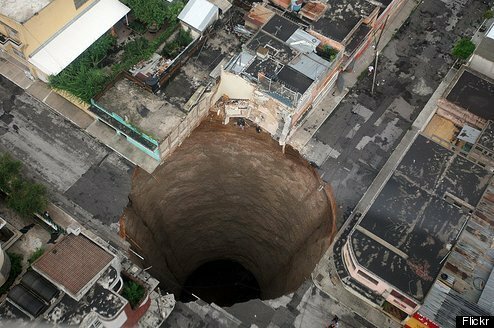 A closer view of the May 2010 Guatemala sinkhole. It measured 66 feet across and 100 feet deep. A 330-foot-deep sinkhole opened up before dawn, killing two teenage siblings, Irma and David Soyos, and their father Domingo Soyos, 53, when it swallowed about a dozen homes and forced the evacuation of nearly 1,000 people in a crowded Guatemala City neighbourhood. Officials blamed recent rains and an underground sewage flow from a ruptured main for the tragedy. The pit stank, growled and shook the surrounding ground. Water could be heard in the depths. Authorities fear it could widen or other sinkholes open up. Residents had heard noises and felt vibrations for weeks. Since this happened twice in three years, there's a greater risk that it could happen again. Geologist Sam Bonis, who worked in Guatemala's geographical institute for 16 years, claims that it may happen anywhere in the city. The Guatemala sinkholes of 2007 and 2010 caused some buildings to fall down, but relatively few people were hurt. However, that may just make it a matter of time before it happens in an area with more people. Logging Threatens Mystical World (In the Environment section) - Underfoot lies another world, even more ancient: a dark labyrinth of caves and subterranean streams carved through limestone and marble bedrock. Huge sinkholes, pits and vertical crevices called grikes riddle the forest, channeling water downward, where it may flow for miles before emerging. This landform, characterised by subsurface drainage, is known as karst.